2002 - A Gicleé Print of this piece is in San Diego being sold by a rep. The young maidens of Vrindavan adored Lord Krishna as their beloved. They were known as the gopis. Each gopi felt so much love for the Lord that she danced with him feeling that he was hers and hers alone. 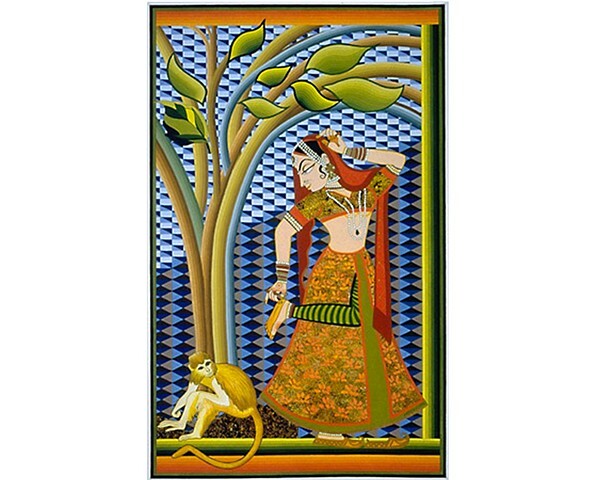 In this painting, the topi is being observed by the inquiring mind, represented by a monkey. He observes her with the pure mind of detachment, without judgment, and perhaps looking to learn the secrets of her devotion.